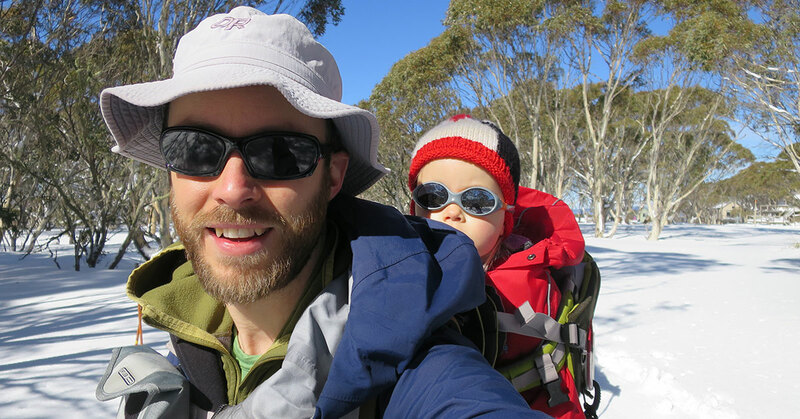 Bogong staff David on the trails at Dinner Plain with his daughter sporting Julbo sunglasses in a Mont Bambino child carrier. Climbing with kids, or hiking with kids, can be an intimidating prospect. Perhaps you've thrown it into the "Too Hard" basket. 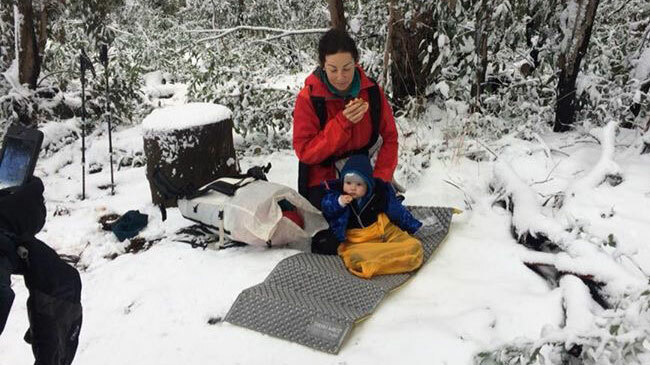 At Bogong, we've been enjoying hearing about staff adventures with their little ones recently. So, I've decided to write up some tips on climbing, hiking and skiing with kids, based on my experiences with my two-year-old. 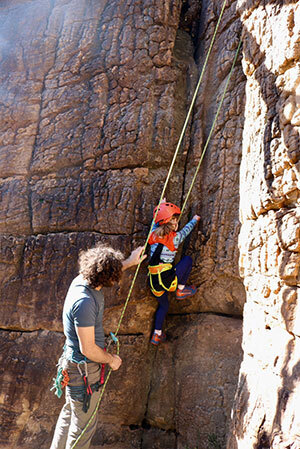 Bogong manager HP belays his daughter at Summerday Valley in the Grampians. At what age can kids start climbing? There's no real "start age". It depends on you (how comfortable you are; your level of experience) and your kid (how keen he/she is; how physically adept). But, it's worth noting that you need a secure harness that your child isn't going to fall out of. Very young kids don't have well developed hips, so you'll need a harness setup that addresses this. Bogong Equipment manager HP wrote an article about kids' harnesses. Crags can be hazardous places for a kid. Ours has always worn a helmet, even if she doesn't leave the ground. And, we always have one person on the ground on child-minding duty. Not only is it safer for the child, but it's also a courtesy to other people using the crag. Don't choose a crag with an epic walk-in that involves an exposed scramble on loose terrain. Also, pick a crag with terrain that you think your child can handle – if the base of the cliff is particularly cramped, narrow or steep, it might not work for your kid. Obviously, avoid crags with lots of loose rock that could pose a hazard from above. Edelrid Fraggle II KIds' Climbing Harness: Full-body children's harness. With sizing down to XXS, this fits very small ankle-biters. La Sportiva Gripit Kids Climbing Shoe: Kids' climbing shoe that is comfortable (shaped like a foot, rather than a 'climbing shoe') and promotes natural foot movement. Uses La Sportiva "No-Edge" technology. 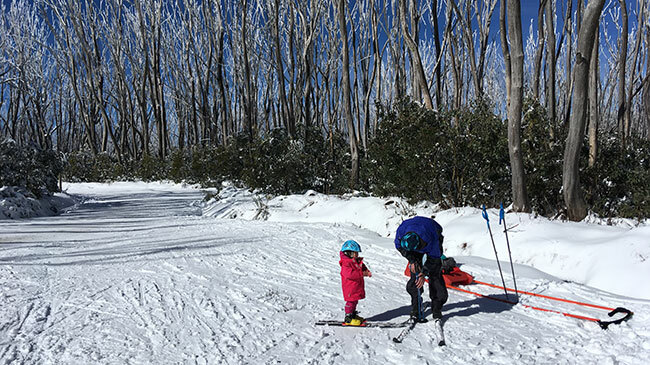 Chelsea's kid has a ski on the groomed trails of Lake Mountain. I went skiing at Lake Mountain recently with a couple of friends, and one of them said to me, "I wish I wasn't so goal-oriented, so I could just relax and enjoy being up here." His partner responded that she didn't have any expectations. Which was lucky, because after about 50 metres of "skiing", my daughter announced she needed to build a snowman. Our friends marched onward with their little one – but, after about five minutes, they'd turned back too because, according to their little one, it was lunch time. It was 10.50am. However, by the end of the day, by way of tag-teaming, all of us adults had each ended up skiing a full circuit. Which is awesome when you head up to the snow, not expecting that you'll get any skiing done at all. Our friends brought a toboggan, which came in handy when the kids got tired of skiing. They'd also – ingeniously – brought a carrot, to finish off a snowman. Should kids use ski poles? That's up for debate. They get in the way if you're teaching them how to downhill ski. But if you're cross-country skiing like we were, we noticed that our child found the ski poles useful for travelling uphill. Being cold and wet isn't fun. We dressed our child in warm, waterproof gear. We found waterproof snow mitts particularly important, because there was lots of snowman-building going on. And, if your kid stacks (inevitable), they're going to be landing at least partly on their hands. Snow = cold! MSR Shift Kids' Snow Shoes: Designed for pre-teens. These snowshoes are sized for smaller, lighter people. MSR Shift Snow Shoes fit footwear between EU 32–41 and a load up to 57kg. The challenges associated with bushwalking with children are different depending on their age. When our child was six months to a year and a half old, we carried her in a child carrier designed specifically for hiking. Being the independent little person she is, she's since announced that she can hike by herself and carry her own bag... which isn't necessarily an easier prospect, because little legs get tired quickly. People often ask: What's the oldest a child can be, to be carried in a child carrier? The answer is about three or four years old (or around 18–20 kilos). It's worth noting, too, that most carriers are designed to carry children that aren't likely to walk long distances. If you've got an older child, you have to ask yourself if you want to carry an eight-year-old for 20 kilometres! Our staff member Stephen's wife wrote a blog article on walking in the Swiss Alps with a then seven-year-old. Read it here. Mont Austral Kids' Bushwalking Jacket: A proper, Mont-quality bushwalking jacket with most of the features of its adult-sized equivalent. Made from classic Hydronaute 3-layer waterproof, breathable fabric. 100% factory seam sealed. Outdoor Research Solstice Kids' Sun Hat: In my experience, it's worth getting a hat that is water-resistant and is capable of drying quickly. This one also comes with loops for a chin cord, which is handy because hats tend to take flight when it's windy or get pulled off by low branches. Also, these hats easy to clean – chuck them in the washing machine along with the rest of your dirty gear. See our range of kids' outdoor gear.